When gold goes up, trade gold miners. When oil goes up, trade refiners! The oil has gained a value – thus, oil-related companies record more profits and as a result, their stocks increase substantially. Specifically, Oil & Gas Refining & Marketing industry is shaping a strong trend for healthy stocks. Today I am going to introduce a trading setup of Marathon Petroleum Corporation. A light crude oil experienced very low price levels at the beginning of 2016 at super low of 26.05. Since that time the price bounced up forming a very long triangle pattern. It was failing to break the resistance (orange dashed line) for almost two years. 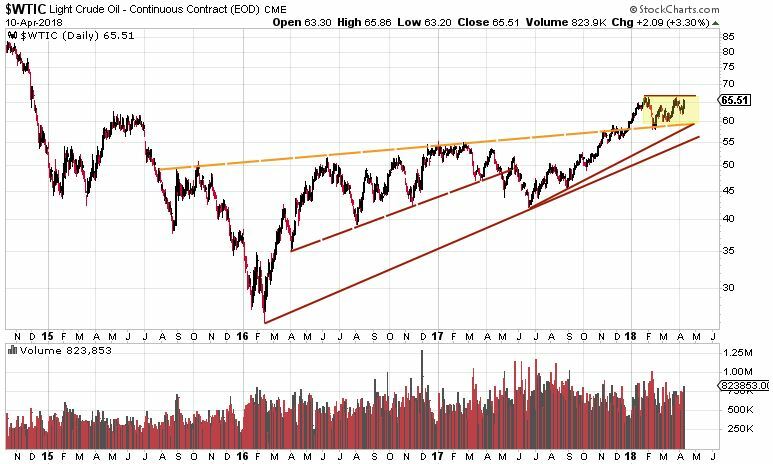 These constant swings within the triangle made oil & gas industries uncomfortable to invest in. Refiners’ earnings were changing satisfactory/unsatisfactory results from quarter to quarter respectively, which also resulted in higher level of future uncertainty. Finally, at the beginning of this year the price pierced through the orange resistance and thus when its movement stays in a yellow area or above, the good quality stocks will outperform and rise significantly. The company operates in refining, marketing and transporting of oil in the US. The last four reported earnings: one missed, three beat the estimates. The revenue has been significantly rising on a quarterly basis. The fundamentals are fitting well for trend following strategy! The company has been on a bull run for several years. The orange lines represent the current bull channel with a strong trend. 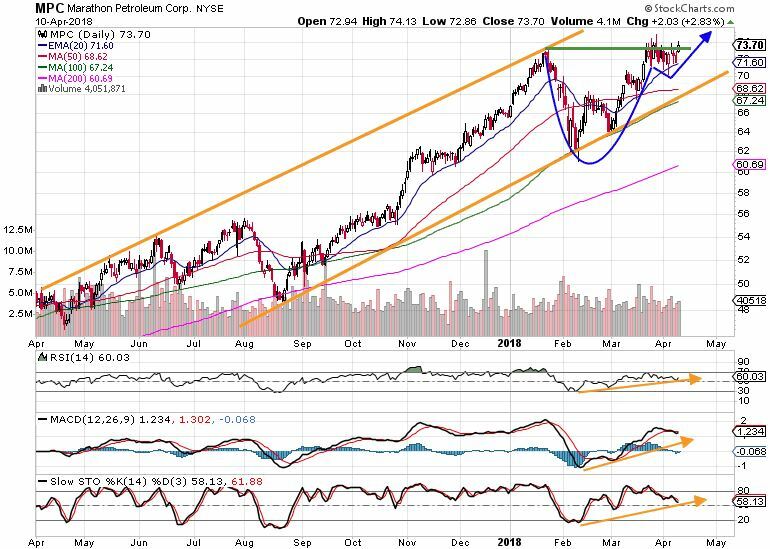 Marathon Petroleum has recently developed a cup and handle pattern that is very likely to complete. Completion of the pattern is determined by price staying above the green line. It has yesterday closed just slightly above. If this holds, the price is poised to rise significantly. The strong trend of the current setup is supported by stochastic technical indicators: RSI is above 50 and trending higher, MACD line is about to cross the signal line and the Slow Stochastic is above 50 and trending higher. Marathon Petroleum Corporation offers great investing opportunities. Important is to stay disciplined and focused on big picture!